Being able to cycle to work is a real pleasure, but it’s all too easy for complacency to set in. The daily commute, even with a variety of usable routes, can become a bit of a ritual. Today however, was one of those commutes that serves to remind me just how lucky I am. Inspired by @JohnnySanders adherence to the principle of N+1, a quick exchange of tweets and we were all set. 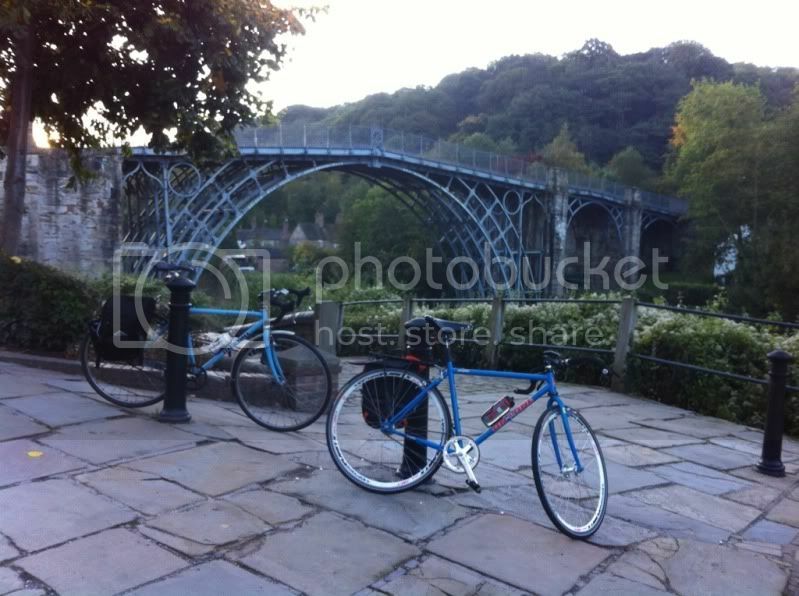 An extended commute to work taking in the Ironbridge Gorge, and including the wonderfully named Jiggers Bank. The weather was good as we rolled out of Shifnal, cold, but dry. As we dropped into the Gorge it was interesting to compare the two bikes we were riding. Two incarnations of that most versatile of bikes, The On-One Pompino. Whilst mine wears it’s battle scars well, John’s still has the shine of a new bike. It seemed only right to take a picture under the Iron Bridge which gives this Gorge its name. What better way to celebrate glorious steel than to contrast our modern bikes against the world’s first iron bridge, built over 230 ago. The picture stop also gave us chance to take five ahead of the climb of Jiggers Bank. This isn’t a big deal under normal circumstances, but with only one gear at our disposal, it presented a more significant challenge. It starts easily enough as you begin pass the YHA, and the real climbing starts as you pass through the traffic lights and go under the railway bridge. From here this climb is a series of false flats punctuated by sharp ramps. The changes of gradient, not to mention the single gear, make it almost impossible to establish a rhythm. This climb is one that saves its worst until last, and as I edge my way towards the top my legs are burning as I struggle to turn the gear. John’s just ahead locked in his own struggle with the hill. How lucky we are to be able to commute to our place of work via one of the most scenic parts of the country.